Drone is one of the powerful gear that you can use to defeat powerful foes from a range; whether there is a horde of zombies in Sandcastle Level 30 area, bald guard protecting the special chest, the mercenary group, Miska Zombies, or in stronghold battles. The drone’s pierce damage helps you a lot. However, crafting a drone is not quite easy and you will have to use it wisely because modules don’t have sturdiness. Once you consume all of their durability, you will have to craft again. Let’s learn how to craft a basic drone in LifeAfter game. LifeAfter Drone Crafting – Drone Hangar. Modules, and much more. You need five modules to build a drone; Framework, Engine, Navigator, Energy Core, and Skill Chip. Drone Engine – The drone’s engine stats determine its speed and also impact its attack power. Drone Energy Core – It is the energy source for your drone. The HP of the drone is affected by these two modules. You will need to repair the drone often to recover the HP. Framework – The framework module is responsible for armor, attack power, and input power. Basic Navigator – This module is responsible for armor, altitude, and flying distance. Drone Chip – This module is responsible for input power, attack type. You can craft all these modules using the gear workstation once you reach the manor level 6. Gear workstation -> craft -> module crafting -> here you can see all the modules; you need one unit of each module. Energy Core – To craft energy core, you need (2) film fabric, (5) hard aluminum alloy, (6) plastic, 12(grease), (5) nail. If you don’t know how to obtain film fabric, you can read the details here(Polymer, Film Fabric). Nails – You can buy from the NPC in the camp’s weapon shop or purchase from trade city. Basic Engine – You need (2) Polymer Coating, (5) Hard Aluminium Alloy, (6) Plastic, (12) Rugged Leather, and (5) Nails. Rugged Leather – You can obtain this material by hunting animals in the mouth swamp map. Animals such as crocodile, wolves, infected, life suckers, believers. Basic Framework – To craft this module, you need (2) film fabric, (5) nylon cloth, (6) hexagon nail, Kenaf Leaf, and glue. Kenaf Leaf – You can obtain this item by gathering hemp in mouth swamp. Basic Navigator – For this module, you need (2) film fabric, (5) nylon cloth, (6) hexagon nail, (25) cracked tough, (5) glue. Cracked Tough – You can get this item by logging trees in mouth swamp. Glue – Get it from the camp’s weapon workshop or from trade city. 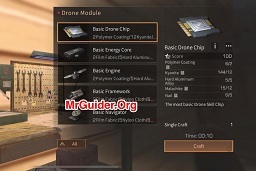 Basic Drone Chip – For this module, you need (2) Polymer Coating, (12) Kyanite, (5) Hard Aluminium Ore, (12) Malachite, (5) Nail. Malachite – You can get this item by quarrying in mouth swamp. Once you have all above-mentioned modules, you need to assemble in the gear workstation to build/craft/claim a drone. Gear Workstation – Equip Drone – tap the + button and select the corresponding module. Once you are all done, you will see the craft and claim option. After that, the game will put the drone in your bag. 4.) Drone Hangar; How to use a drone? After claiming the drone, go to the inventory(bag) -> tap the drone -> put in the hangar. After that, tap the drone hangar button on the right side of the screen(below the mini-map). There you will see your drone in one of the six parking spots. You can park more than two drones in the drone hangar. But, to unlock more slots, you will need to spend gold bars. Now, tap the drone in drone hangar screen -> three buttons will appear at the bottom of the drone hangar screen; view details, put back, and release. Also, on the bottom-left side of the window, you can check the drone hangar power and drone hangar ammo. Tap the + button and use resources to restore energy, ammo. View Details – Tap this button to check the HP, energy, and durability of modules. Tap any module to get more info. Tap quick repair button to repair the drone. Put Back – This will put the drone in the bag. 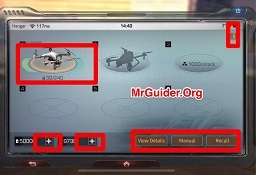 Release – Tap this button if you want to use the drone. The drone will automatically target the foes for you. 5.) How do I upgrade or enhance modules? You can enhance the stats of these modules by modifying their formula in the R&D facility. Formula Research Station -> use -> formula modification -> tap the + button(drone but formula mod) -> tap formula -> select -> modify. In LifeAfter, you need module etchant item to modify the drone formula. 6.) How to get Module Etchant In LifeAfter? As of now, I know only two ways; the first one is to exchange FED credits. And, the last one is to exchange the event currency. 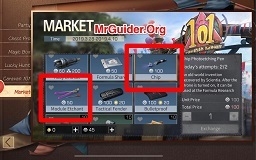 You can get Module Etchant and Chip in the event market. For example; In the ongoing April Fool event, you can get one Module Etchant for 50 Training Badges and one Chip for 100 Training Badges. So this is the LifeAfter Drone guide for the beginners. If you have any question, feel free to ask in the comment section below. Hey I’m new in this game and I really want to get high building score. Can you make an article on how to increase your building manor score? @Raveena Hello, The total build score(Manor Rank) depends on three things; structure, defense, and furniture. Enhance the structures(Enhancement, there are loads of type of structures; type 1, 2, 3, etc.. use them), add defense facilities to the manor, and put luxurious furniture items to increase the build score. Hi, your guide it work but I have a problem with it. My drone doesn’t want to put in drone hangar. My manor is lvl 6 and I just made the drone then the problem came my system say I don’t have a place to put my drone in a hangar. I confused please help me. i want to bulid a drone, but u said that it doesnt have sturdiness, so, is its durability consumed by the drone been attacked by other player or just by flying the drone, the durability will decrease little by little? And the durability, is it the whole drone durability or its part’s durability? i mean, when one part have reach 0 durability, just build the new part and replace it at the existing drone? or build the new drone? @Ayoyo Haha, Yeah, that’s annoying. No sturdiness. And, yes, as you use the drone, the durability of its parts will decrease over time. In my case, except the CHIP all the parts lost their durability at the same time. After that, you will have to craft them again. But you can dismantle those parts after they lose all durability; you will get Poly, Fab after dismantling. Can drones sent all materials from farming to base camp? Like the ones in farstar and charlestown?